After going to the Rastro Sunday morning and having lunch in Plaza de España (after only 3 hours of sleep), Chad and I headed back to my apartment for an afternoon siesta (nap). We were supposed to meet Gregorio at 6pm in Ventas for a 7pm bullfight, so I set my alarm for 5:15. I woke up to Chad opening my door at 5:40, asking me, "Weren't we supposed to meet him at 6?" I wiped some drool from my face, threw on some deodorant and shoes, and left the apartment half-asleep. 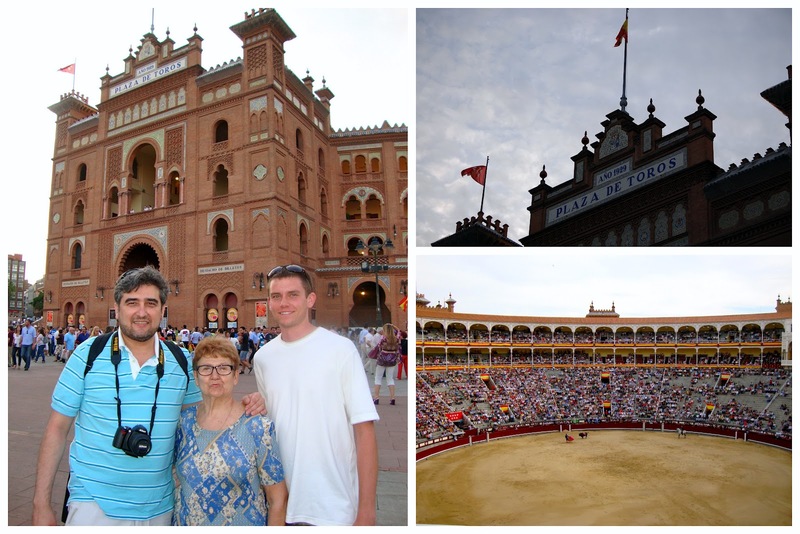 Madrid's bullfights take place in the Plaza de Toros in Ventas, right next to where I lived from 2009-10. Spanish people's opinions of bullfights are divided. For those that despise bullfighting, some oppose it because of animal rights, and others because it was associated with the Franco regime. Those in favor will often mention its cultural significance to the country. In 2010 bullfighting was banned in the region of Cataluña, where Barcelona is located. When I studied at the Complutense here in Madrid, every now and then students would be petitioning for signatures in opposition of bullfighting. Despite all of the controversy, Chad and I decided to see what it was all about (I had never gone to a bullfight previously). The bullfighting season is from March to October, during which there is a bullfight every Sunday evening in Madrid. During the festivals of San Isidro (mid-May to the beginning of June) there are bullfights every day for 20 days straight. We attended one of these corridas (bullfights; literal translation: running of the bulls). In Spanish corridas, three toreros (bullfighters) each fight two of the six bulls. There are three parts (tercios) to each fight; each part begins with the sounding of a trumpet. Our fight was special because the toreros were all on horses instead of on foot. Chad said his favorite part was seeing how the horses walked. If the torero did a good job and also killed the bull quickly, many people would wave a white handkerchief at the end of the round. If the autoridades (seated in the box in the center of the photo below) put out a white handkerchief, it means the torero has won an ear (from the bull). In the picture below you can see the "authorities" (all in suits), and their white handkerchief out in front. If the torero was amazingly good, he may get two white handkerchiefs, meaning both ears. In some towns, toreros can also win the tail (in addition to both ears, if they're crazy good). 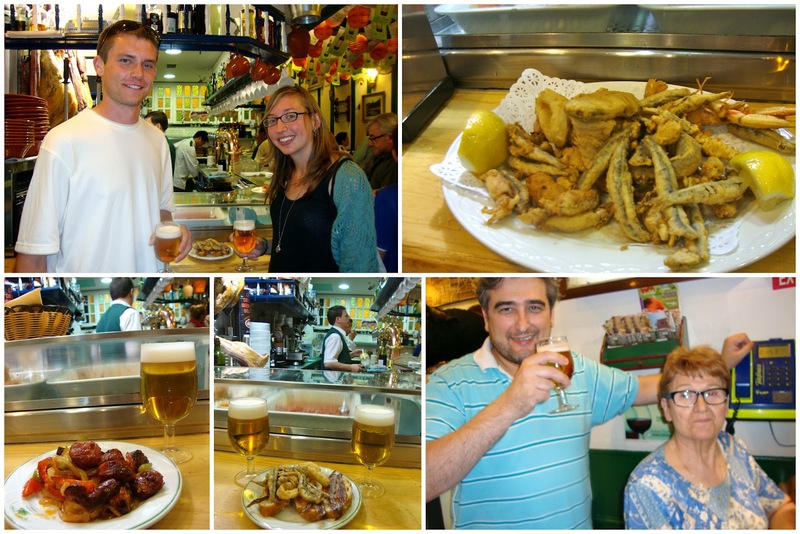 After the bullfight we headed to the usual Rincón de Jaen for some cañas and tapas. Price: Entradas start at 2.20 euros and go up; depending on when the bullfight is, who the bullfighters are, and where you sit. Tickets: Can be purchased at the ticket window right at the plaza de toros, or online here. Advice: Bring a pillow to sit on! You could also rent a cushion there for 1.20 euros. I'd also recommend bringing a snack or cold drinks; you can bring in whatever you want. You can buy drinks and food there, but it's obviously cheaper to bring your own. There's an OpenCor (a grocery store) just across the street from the plaza de toros, so you could pick up some snacks there before the bullfight.